An endodontist is a dentist with special training in diagnosing and treating problems endoassociated with the inside of the tooth. To become specialists, they complete dental school and an additional two or more years of advanced training in endodontics and use of a microscope. Endodontics is one of the nine specialties recognized by the American Dental Association. They perform routine as well as difficult and very complex endodontic procedures, including retreatment of previous root canals that have not healed completely, endodontic surgery, as well as dental implants. Endodontists are also experienced at finding the cause of oral and facial pain that has been difficult to diagnose. Endodontic treatment is necessary when the pulp, the soft tissue inside the root canal, becomes inflamed or infected. The inflammation or infection can have a variety of causes: deep decay, trauma, repeated dental procedures on the tooth, or a crack or chip in the tooth. In addition, an injury to a tooth may cause pulp damage even if the tooth has no visible chips or cracks. If pulp inflammation or infection is left untreated, it can cause pain or lead to an abscess. In order to save the tooth, the inflamed or infected pulp is removed, the inside of the canal carefully cleaned, sterilized and shaped, then the space is filled and sealed. Afterwards, you may need to return to your dentist, who will place a crown or other restoration on the tooth to protect and restore it to full function. After restoration, the tooth continues to function like any other tooth. 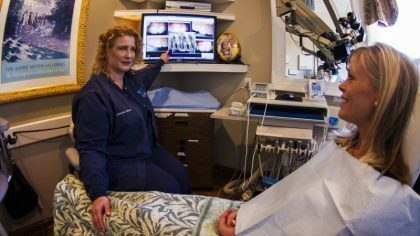 Although some patients need an initial diagnostic visit in order to determine the treatment appropriate for them, many patients can have their endodontic treatment completed in a single visit. While the amount of time needed to complete treatment varies based on the individual case, we recommend patients plan for their treatment visit to last about 2 ½ - 3 hours. For more information see, www.aae.org.